Runa Alam is a Co-Founding Partner and CEO of DPI. She has 28 years of investment banking, emerging market management and private equity experience. For the three years before starting DPI, Ms. Alam was Chief Executive of two African private equity funds run in parallel: the Zephyr Management African Investment Fund (“ZMAIF”), a joint venture between Zephyr Management of New York and Prince Al-Waleed’s Kingdom Holdings, and the Pan-African Investment Partners and the Pan Commonwealth Africa Partners (“PAIP/PCAP”) funds, sponsored by the IFC and the Commonwealth Secretariat. 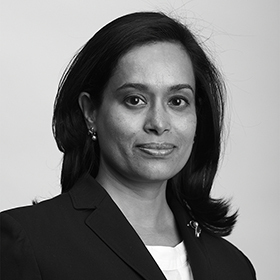 Ms. Alam continues to serve on the Eaton Venture LLP and UBA Board of Directors, and has previously served on the Letshego Holdings Limited and Celtel Board of Directors. Ms. Alam was formerly a Director of the AIG Africa Infrastructure Fund, managed by Emerging Market Partnership in Washington, and has “on-the-ground” management experience in emerging markets having founded and managed both Peregrine Bangladesh and Union Capital Bangladesh in the 1990s. Ms. Alam started her career in New York working for investment banks including Morgan Stanley and Merrill Lynch, where she worked in mergers and acquisitions and corporate and tax-exempt finance. She holds a BA in International and Developmental Economics from the Woodrow Wilson School of Princeton University (1981) and an MBA from the Harvard Business School (1985) and was also a Harry S. Truman Congressional Scholar. Ms. Alam is a member of the EMPEA Advisory Board and Africa Panel. She is a member of the Millennium Promise’s UK Board and is on the Advisory Board of the Tony Elumelu Foundation.